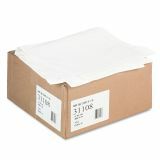 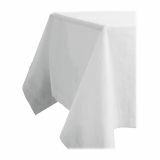 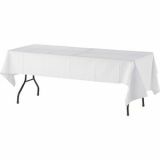 Tatco Paper Table Cover, Embossed, w/Plastic Liner, 54" x 108", White, 20/Carton - Three-ply, embossed paper tablecovers with liner protect tabletops from spills. 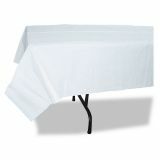 Tablecovers are designed to fit 8' tables. Contains 44 percent post-consumer recycled material.